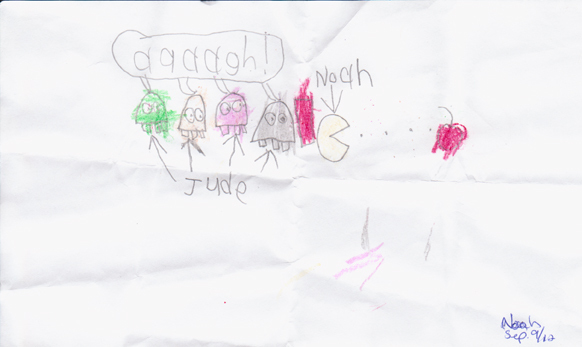 Huh, strange that Noah would choose to identify with Pac-Man rather than the ghosts. Here we have a character that runs around a maze being terrified of the supernatural and constantly popping tiny pills to keep himself going. Occasionally he gets a hit of the "good stuff" which turns him into a rage monster who, through the power of these mind and body altering substances, temporarily conquers his fear enough to attack the ghosts before they go back to hounding him. 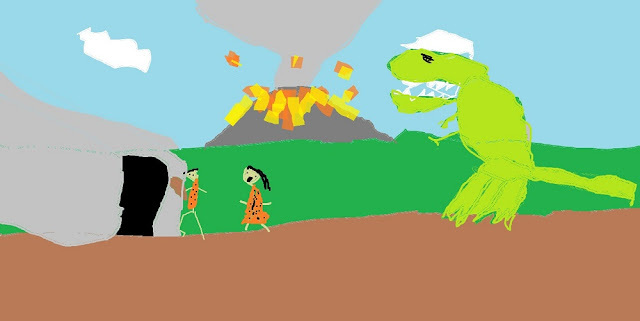 Moral of the story: Lock up your medicine cabinet or Noah just might take Jude out? Well, if you think about it, it might not be too far off... "Pills" = "food". "Good stuff" = "Fruit candy with red dye that I sneak when I can find it". Result: hypermaniac child.